Deputy Sheriff Shayne York succumbed to gunshot wounds sustained two days earlier when he was shot by a robbery suspect after being identified as a deputy sheriff. Deputy York and his fiancée, who was also a deputy with the Los Angeles County Sheriff’s Department, were off duty in a hair salon when two suspects entered and ordered everyone to the ground. While one suspect covered the customers the other collected everyone’s wallets and purses. The two suspects discovered Deputy York’s badge and immediately shot him in the back of the head as he lay on the ground. Deputy York had not resisted and remained calm throughout the entire robbery trying to keep others from getting hurt. The two suspects were arrested later in the day during a traffic stop by members of the Fullerton Police Department. In August 2000 the suspect who pulled the trigger was found guilty of first degree murder with special circumstances and sentenced to death. The other suspect was sentenced to life in prison. 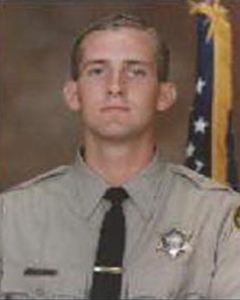 Deputy York had served with the Los Angeles County Sheriff’s Department for 2 years. He is survived by his fiancée, parents, and brother.